57 easy-fit pieces for imaginative building fun. 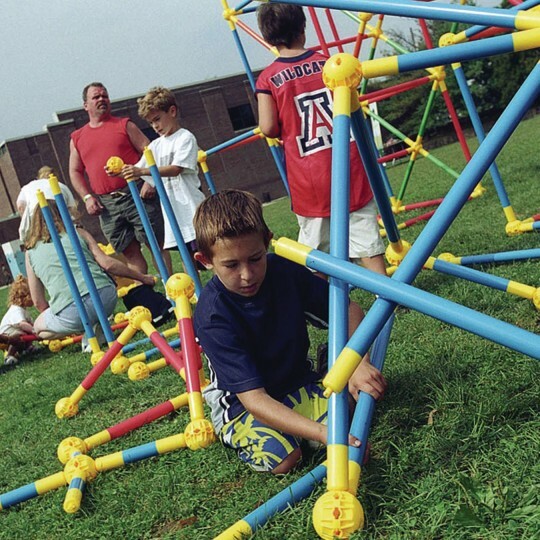 Kids make bridges, obstacle courses and more! Connect and twist the tube into the connector spheres. The product is listed as appropriate for 3yr old children and up. I purchased it for Pre-K and Kindergarten children. They were not able to build with the Toobeez by themselves. It took a great deal of teacher assistance. Once constructed the structure was very unstable and came apart easily. My Students are Toobeez Crazy!! I use this product as one of the choices in my Maker Space in my classroom. It is one of the most popular activities for my students in grades 1 - 6. What a great chance to build and play and work together. This product is being used in the Makers Space set up in my classroom. I have found students do not really know how to create without directions or examples. Toobeez allow the students to investigate beginning engineering skills. Loads of fun for groups! Use as free-play element at our events and festivals. Kids love being able to create something quickly on their own!